So many natural skincare products have been on my wish list lately, so I am excited that I got to check a few off the list these past few months. I have been testing 3 serums and needed to share them with you after loving the results. 1. Vintner's Daughter - To say this was on my wish list was an understatement. There has been so much buzz about this serum that I couldn't wait to get it on my face! This serum is full of so many great vitamins and potent botanicals that it really delivers on performance. It targets anti-aging concerns, firmness, radiance, clarity and congested skin struggles all in one serum! It has the texture of a medium weight oil, but can be used as a serum under moisturizer, as a face oil or alone. I wanted to get the full experience so I used it alone after cleansing and toning, and within a few days my skin responded amazingly. I noticed my forehead bumps minimizing, a stubborn chin breakout began to subside and after 2 weeks I could see a significant difference in my skin's overall texture, tone and clarity. Even some hyperpigmentation left over from summer began to fade! I have begun adding a moisturizer on top of this for some nights, but I am still loving the results of just the serum used alone. So much hype, but this lived up to all of it. 2. 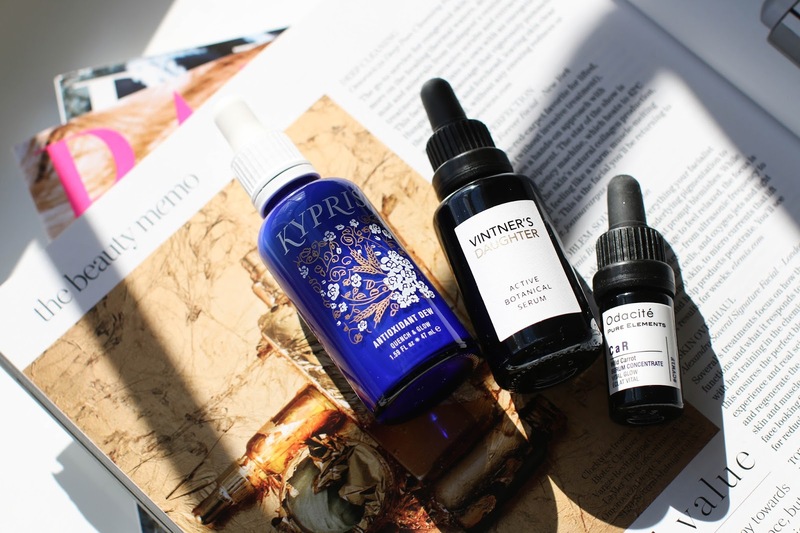 Kypris Antioxidant Dew - After falling in love with this top seller from Kypris, I was anxious to try more from the line. 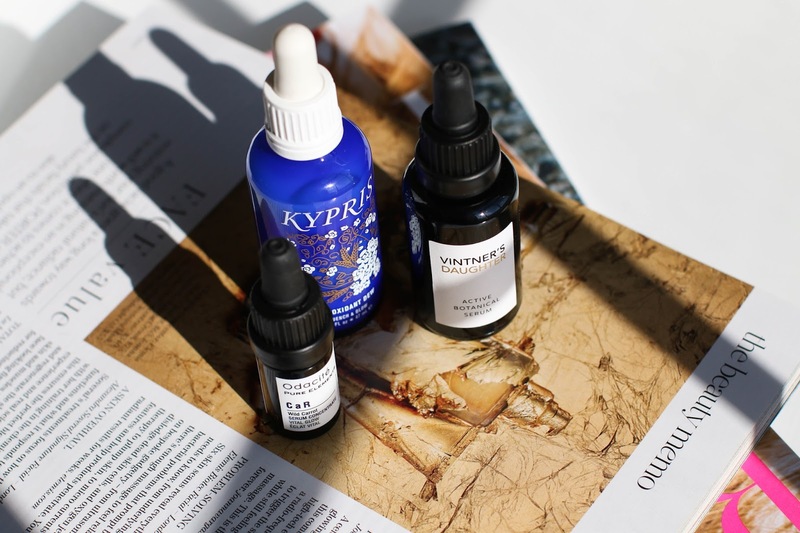 I had just finished up a bottle of one of my favorite morning serums, and this came at the right time and was a perfect addition to my morning skincare line-up. It's has a lightweight yet incredibly hydrating texture, that immediately makes my skin feel supple, moisturized and wears beautifully under makeup. While I look for a potent anti-aging product for my evening routine, my needs in the morning are focused on keeping my skin hydrated and balanced for the entire day so my makeup looks its best. I found that on the mornings I would use the Antioxidant Dew, my skin was less oily at the end of the day and my makeup stayed in tact longer. While I can use it alone, I also enjoy wearing it under a daytime moisturizer (loving this one right now) or an SPF (alternating between this one and this one) before my foundation. 3. Odacite Wild Carrot Serum Concentrate - Even though I have combination skin that can be on the oily side, I still look for products that will give me a great glow. I have certain skincare products that make me shiny (often I don't continue using them) and others that make me glow. This Odacite Concentrate falls in the glow category, though the thicker texture initially had me nervous. It is a rather rich oil and I was hesitant that it would be too heavy for my skin. I used barely one drop after cleansing and toning, rubbed it gently between my palms and then pressed it into my skin. It took about 1-2 minutes to sink in, but there was no residue left on my face and it absorbed completely. The glow was almost immediate and my skin instantly looked healthier. And the more nights I used it, the better my skin looked and the glow continued to the next morning when I would wake up. If you have drier skin, I would recommend adding it to your morning routine to boost radiance under your foundation. Serums are simply more potent, powerful and concentrated than moisturizers. They deliver stronger results and are the one product I would invest in over a moisturizer to be honest. The Kypris one is lightweight and comfortable feeling on the skin - but if you want something that really will give stronger anti-aging and overall resurfacing and evening out of the skin tone - go for the Kypris Midnight Catalyst that I mentioned in the post. It is wonderful. thank you for the reviewes. I'm actually looking for new serum now that winter is coming.